Plant sources are a valuable starting material for drug development. These plants are the potential therapeutic agents, which provide maximum benefits with minimum adverse effects. The World Health Organization has developed and launched the traditional medicine strategy 2014–2023 in response to the World Health Assembly resolution on tradition medicine (62.13). The strategy aims to support member states in developing proactive policies and implementing action plans that will strengthen the role traditional medicine plays in keeping the population healthy.Achyranthes aspera L. belongs to the family Amaranthaceae and is commonly known as ‘prickly chaff flower'. It is the herb of 1 cm in height is found throughout India. Achyranthes aspera stem is angular, showing a single layer of epidermis with thin cuticle, uniseriate multicellular hairs, having crystal of calcium oxalate in the cortex and pith. Leaves are opposite, 2.5–12.5 cm, extremely variable, generally thick, pubescent tomentose velvety, rarely glabrate petiole short. Flowers are 4–8 mm longer than the bracteoles, sepals sub-equal. The mother tincture is prepared using the whole, fresh plant, dried [Figure 1]. The drug strength is 1/10. Clinically, Achyranthes aspera is used in chickenpox, encephalitis, glomerulonephritis, infectious diseases, kidney abscess, measles, meningitis, neuritis, psittacosis, pyelonephritis, rubella, scarlet fever, septicaemia and typhoid fever. In the present study, the extract of whole plant excluding root of Achyranthes aspera was prepared, and qualitative phytochemical analysis of water extract and in dilution 30 was carried out. Achyranthes aspera plant was collected from village Ladapura, Greater Noida, Uttar Pradesh, in the 1st week of August 2016. Achyranthes aspera 30 was procured from Bakson Drug and Pharmaceutical Private Limited Lot number P1222, M. L. Number: H. P. 2/H. All other used chemicals have been procured from Metropolitan Scientific Company, Delhi. 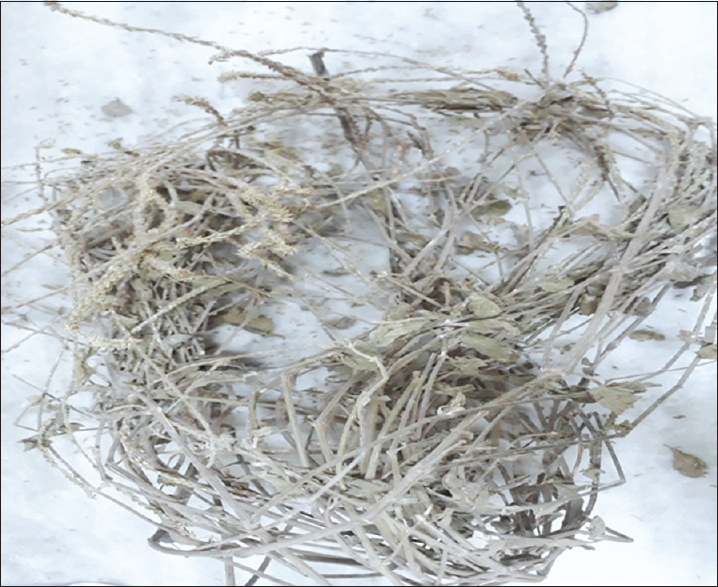 Parts of Achyranthes aspera plant were dried under shade for 15 days at physiology laboratory of Bakson Homoeopathic Medical College and Hospital, Greater Noida, U.P., India. Dried parts of the whole plant excluding root were homogenised to fine powder using mortar and pestle. The fine powder is stored in an amber colour glass bottle to carry out further studies. The water extract was prepared by taking 10 g of fine powder in 100 ml of water, stir for 6 h and leave it overnight then filtered it through Whatman filter paper no. 1. Physiochemical parameters of the powdered drug such as ash values and extractive values loss on drying were performed. For determination of the total ash value, 2 gms of air dried drug powder, was placed as a uniform layer in crucible silica. It was ignited on the burner and heated at 550±50°C in muffle furnance until it was white, indicating the absence of carbon. It was allowed to cool down in a dessicator and weighed to determine the percentage of ash with reference to air- dried drug. Silica crucible was placed again in furnace for 30 minutes and cooled in dessicator and weighed. This process was repeated untill the constant weight of crucible was obtained. For determination of acid-insoluble ash, the ash was boiled with 25 ml of dilute HCl for 5 min and it was filtered through an ash-less Whatman filter paper and washed with hot distilled water until it became acid-free. Then, the paper was placed in silica crucible and burnt in a muffle furnace. When it became carbon-free, it was placed in a desiccator to cool down, and weight was taken and calculated. Ten grams of air-dried drug powder was taken in a closed flask, and 100 ml of water was added. It was stirred for 6 h. Then, it was allowed to stand overnight. Then, it was filtered through Whatman filter paper. 5–10 ml of filtrate was taken in a pre-weighed Petri dish More Details and dried at 105°C till the constant weight achieved. The petri dish was placed in the desiccator and allowed to cool; the weight was measured and the solvent extractive value was calculated. Preliminary phytochemical screening was performed for several compounds such as carbohydrates, steroids, alkaloids, saponins and phenolic compounds., These compounds are termed as secondary metabolites and are responsible for therapeutic effects. To check the presence or absence of metabolites, the samples were subjected different chemical tests as described below. Fehling's test – 34.66 g of copper sulphate was dissolved in distilled water and made up to 500 ml (Fehling A). 173 g of potassium sodium tartrate and 50 g of sodium hydroxide were dissolved in distilled water and made up to 500 ml (Fehling B). 1 ml of Fehling's A and 1 ml of Fehling's B in a test tube were mixed. 2 ml of testing solution in the test tube was added. The red precipitate formed which showed the presence of reducing sugar (glucose and fructose). Molisch's test –5 ml of testing solution was taken in a test tube. Two drops of Molisch reagent was added and mixed thoroughly with a dropper. 3 ml of concentrated sulphuric acid was added along the sides of the test tube. A reddish violet ring appeared at the junction of two liquids. Hence, monosaccharides were present. Seliwanoff's test – 5 ml of Seliwanoff's reagent was taken in a test tube. 5 drops of the testing solution was added and heated the contents to just boiling. The presence of red colour indicated that fructose was present in the testing solution. Xanthoprotein test – 1 ml of concentrated nitric acid was added to 2–3 ml of test protein solution and heated to boil. The solution was cooled. 40% NaOH was added. A white precipitate formed on adding nitric acid which on heating turns yellow and then dissolved to impart yellow colour to the solution. On adding alkali, the colour deepened to attain orange colour. Biuret test – 2–3 ml of testing solution was taken in a test tube. An equal volume of 10% sodium hydroxide solution was added and mixed thoroughly. Then, 0.5% copper sulphate solution was added drop by drop and mixed until a purplish violet colour is obtained. Positive reaction indicated that the given protein solution contained at least two peptide bonds. i. Wagner's test – Test solution was treated with Wagner's reagent (iodine-potassium iodide solution) which showed reddish brown precipitate. i. Foam test – Test solution was shaken which showed foam formation and it was stable for at least 15–20 min; positive for the presence of saponins. The total ash was 9.59% and acid-insoluble ash was 2.27% as shown in [Table 1]. The percentage yield of water-soluble extract was 20.91%. The water extract and dilution 30 showed the presence of carbohydrate, protein, saponins, phenolic compound and alkaloid as shown in [Table 2] and [Figure 2]. Plants contain many bioactive phytochemical substances that produce definite physiological and biochemical action on the human body. The phytochemical research approach is considered to be effective in discovering bioactive profile of plants for therapeutic importance. The total ash was 9.59% and percentage yield of water soluble extract was 20.91%. 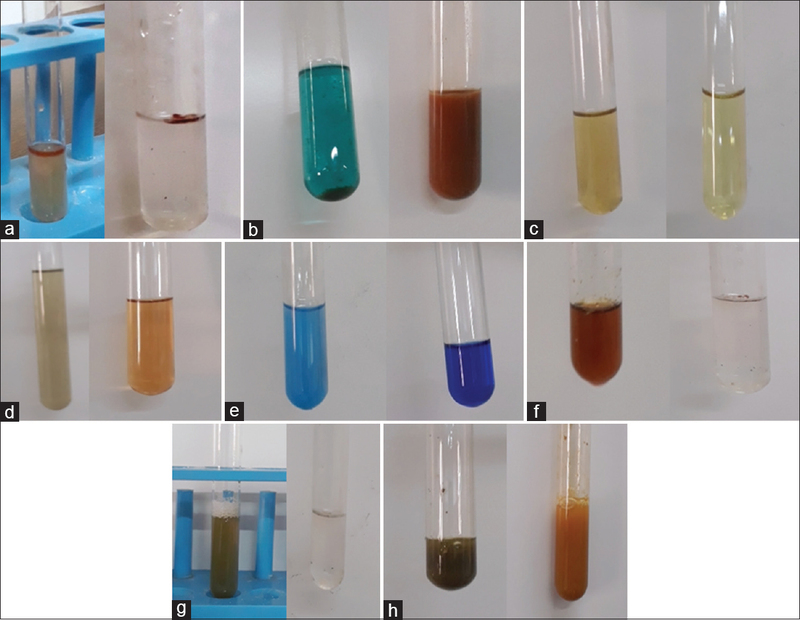 This experiment shows the evaluation of qualitative phytoconstituents of water extract of whole plant excluding root of Achyranthes aspera and Achyranthes aspera 30. The phytochemical analysis of water extract of whole plant excluding root of Achyranthes aspera and Achyranthes aspera 30 shows that various bioactive phytochemicals such as carbohydrate, protein, alkaloid and phenolic compounds are retained even with dilution in Homoeopathic 30 potency of Achyranthes aspera. 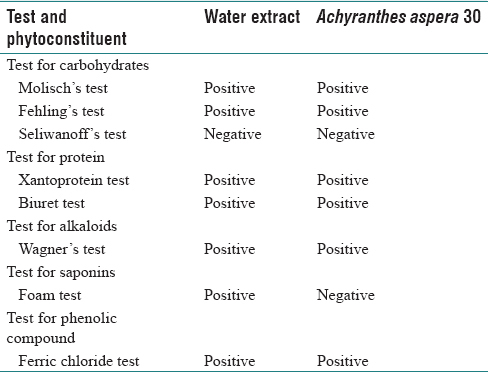 The foam test of Achyranthes aspera 30 is negative whereas of water extract is positive. The qualitative phytochemical analysis shows that various bioactive phytochemicals are retained even with dilution while preparation of Homoeopathic medicines. Achyranthes aspera 30 contains its bioactive phytochemical even on dilution with alcohol. Jitendra B, Vivek D. Pharmacognostical and Phytochemical studies on Achyranthes aspera. World J Pharm Pharm Sci 2012;1:2278-4357, 1316-31. Arora EK, Sharma V, Khurana A, Manchanda A, Sahani DK, Abraham S, et al. Phytochemical analysis and evaluation of antioxidant potential of ethanol extract of Aillum cepa and ultra-high homoeopathic dilutions available in the market: A comparative study. Indian J Res Homoeopath 2017;11(2):88-96. Government of India, Ministry of Health. Achyranthes aspera. In: Homoeopathic Pharmacopoeia of India. Part. IV. 1st. ed. New Delhi: Government of India, Ministry of Health; 1983. p. 2. Murphy R. Achyranthes. In: Lotus Materia Medica. 2nd. New Delhi. B. Jain Publisher; 2009. p. 14. Government of India, Ministry of Health. Determination of Ash. In: Homoeopathic Pharmacopoeia of India. New Delhi: Government of India, Ministry of Health; 1971. William E. Pharmacopoeial and related drugs of biological origin. In: Trease and Evans Pharmacognosy. 15th ed. New Delhi: Saunders, an Imprint; 2006. p. 193. Sucheta DP. Test for carbohydrates, Precipitation and colour reaction of protein. In: Practical and Viva in Medical Biochemistry. Reprint. New Delhi: Elsevier; 2005.